6’+ Episode 174 is Up! 6’+ Episode 175 is Up! Gretchen misses her brother and still has yet to get over his death. So when she discovers a strange amulet in the woods which gives its wielder necromantic powers, she leaps at the opportunity to see her brother again. Bad idea. Not only does she attracts the attention of its original owner, the vampire lord Vellich, but she also accidentally summons up a hoard of zombies. Throw in the vampire hunter who originally stole (and lost) the artifact in the first place and a rival vampire and you have a surefire recipe for chaos! The Dead Matter is the only example I can think of where the remake is the only version of the film made available to the public. 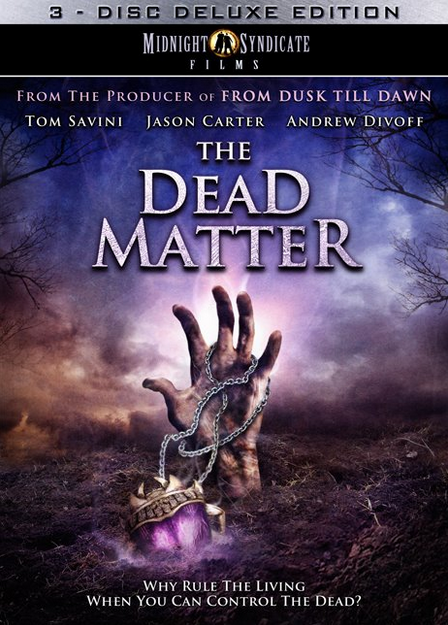 That’s right, The Dead Matter was originally filmed in 1995 as a low budget, shot on video “rough draft” with Edward Douglas intending to make a bigger budget “final draft” when he had the opportunity. Some sources refer to it as a 1996 student film, presumably confusing the formation of Entity Productions and Douglas’ final college project, the 1994 film Journey Into Dementia, with the early take on The Dead Matter. Its being filmed at John Carroll University was probably also a factor. Versions of the themes from both films found their way onto Midnight Syndicate’s self-titled debut album. They later appeared on Out of the Darkness (Retrospective: 1994-1999) in 2006. But here’s the really interesting part: Unused material from the scores of both films was used as a musical blueprint of how the group’s sound would be changing for Born of the Night and other future albums! Several of these became Midnight Syndicate songs proper, with the theme from The Dead Matter was reworked and retitled as “Vampire’s Kiss” for its inclusion on Born of the Night. In 2007, the opportunity to make the film as originally intended finally presented itself. Having raised $1.5 million from local investors, the film’s budget was far greater than the few thousand it took to shoot the SOV version. It also made the film the largest to ever have been shot and funded in northeastern Ohio! In further contrast to the original, filming primarily took place at the allegedly haunted Bissman Building and nearby Mansfield Reformatory. You might recognize that last location from its appearances in The Shawshank Redemption and Air Force One. After some special screenings, the movie was officially given wide release in 2010. But the story doesn’t end there. In addition to the spin-off album The Dead Matter: Cemetery Gates, the film was also the inspiration for a massive corn maze at Haunted Carter Farms in Iowa! 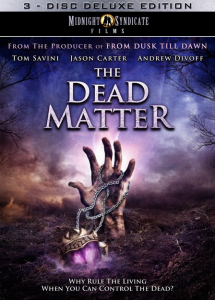 While The Dead Matter isn’t technically a first effort, it does have all the hallmarks of one. There are plenty of inside jokes about the band and it has its share of flaws, but there is also a lot of promise shining through. I suspect part of this is due to the length of time between filmed projects by Edward Douglas. Think of it like going out for a swim after years of staying out of the water. You can still swim, but you’re going to get winded easier and not move as gracefully than you were back when swimming was one of your a regular activities. Although the acting is a mixed bag, I was thrilled with the soundtrack and camerawork. There are plenty of effective shots, such as the zombies lumbering about at night, but occasionally some of the lighting decisions would leave me cold. The scene with one of the zombies at a bar immediately comes to mind. Limiting the amount of computer effects in favor of practical effects was also appreciated. Although Vellich’s obvious wig is incredibly distracting. Given how there are some comedic touches scattered throughout the film, I was convinced it was leading up to something. I even watched the credits fully expecting there to be a post-credits scene about it. Nothing. I guess sometimes a bad wig is just a bad wig. It’s also a lot of fun to spot the references to other films and various appearances from those in the horror business. In addition to Tom Savini playing the vampire Sebed, haunt industry legend Jim O’Rear puts in an appearance as a vampire underling and the narrator is none other than Richard “Count Gore De Vol” Dyszel! Speaking of horror hosts, Charles “Big Chuck” Schodowski makes a brief cameo. Plenty of people from the Midnight Syndicate scored film The Rage show up as well, which apparently led to The Dead Matter being promoted as a sequel to that particular movie in Germany! There is a lot going on in this film plot-wise and I had to leave out some details from my summary (such as the drug subplot and clash of vampire cultures). Part of me enjoys the sheer creativity of the film while another part of me wishes this had been reworked into two separate projects. I was tempted to suggest doing it as an anthology, but I doubt the director wanted to do that since this is a remake of a movie made immediately after a short anthology film. He really can’t be blamed for not wanting to tackle the same style twice in a row. Judging from other reviews, a lot of people are divided over how to rate the film. The zombie scene I mentioned earlier seems to be a litmus test of sorts for whether or not you will enjoy the film as a whole. I think this is definitely worth a rental, especially so you can decide for yourself. Although not currently available on Blu-Ray in the US, the DVD version is available in both a standard edition and a deluxe 3 disc edition. Both versions offer the 89 minute long movie with a crystal clear 1.78:1 anamorphic widescreen transfer, with the audio options being Dolby Digital Stereo and 5.1 Surround Sound. They also have extras like gag reels, the film’s trailer, audio commentary by the producers (which includes director Edward Douglas), music videos and “Maximum Dead Matter.” That last extra plays the movie along with behind-the-scenes footage, concept art, time lapse sequences, interviews and trivia in separate windows. As for the music videos, we get “Dark Legacy” and “Lost” by Midnight Syndicate, “The Dead Matter” by Eternal Legacy and fan videos submitted to the Midnight Syndicate Halloween Video Contest. The winner, “Voodette,” is included along with the two runners up, “Cellar” and “Crimson Door.” The extras menu also has a surprise Easter egg hidden in it! Just go to the bottom of the screen and move your cursor to the right when you get to one of the last options. I won’t say which one in order to make it something of a surprise, especially since the hidden video is one most readers of the site should be very familiar with: Pumpkin Carving With Commentary! After having covered numerous no-frills releases, it’s so nice to review a DVD with a dedicated chapter stop menu again. Exclusive to the 3 disc edition are the CDs for The Dead Matter: Original Motion Picture Soundtrack and Halloween Music Collection. The CD inserts, traycards and booklets are included but the discs themselves are kept separately in the 3 disc casing. Surprisingly, neither of the director’s 90’s films are included as extras! If you want to buy this rather than rent it, I highly recommend going with the 3 disc edition. It’s only $8.00 more than the regular edition when you buy it directly from Midnight Syndicate, which is a bargain considering what it would cost you to buy the film and the CDs separately. It also increases the likelihood of Edward Douglas making more movies. If he doesn’t want to do something completely new right away, he might want to consider revisiting Journey Into Dementia. An EC Comics-style anthology movie from Midnight Syndicate? Yes. Please.